WOW air's financial performance deteriorated in 2017 and 2018 after profits in 2015 and 2016. Rescue deals with Icelandair and Indigo Partners failed. WOW air made big cuts to its fleet and route network, but could not secure fresh capital. Iceland's rapid market growth slowed in 2018, but WOW air still grew by 27%. Its growth was strong, both to Europe and North America, up until summer 2018. Overlap between Icelandair and WOW air was high. WOW air's rapid expansion and the strong competition it faced had been weighing on its financial performance for some time before its collapse. It was not publicly listed and so, financial details were sparse, but some trends can be seen. After making profits in 2015 and 2016 (achieving an operating margin of 10.1% in 2016), the airline lost USD13.5 million in 2017, in spite of a 58% increase in revenue to USD486 million. WOW air's results for 9M2018, reported at the end of Nov-2018, revealed that its revenue had grown by 35% to USD501 million, but its net loss had widened to USD34 million from USD14 million in 9M2017. 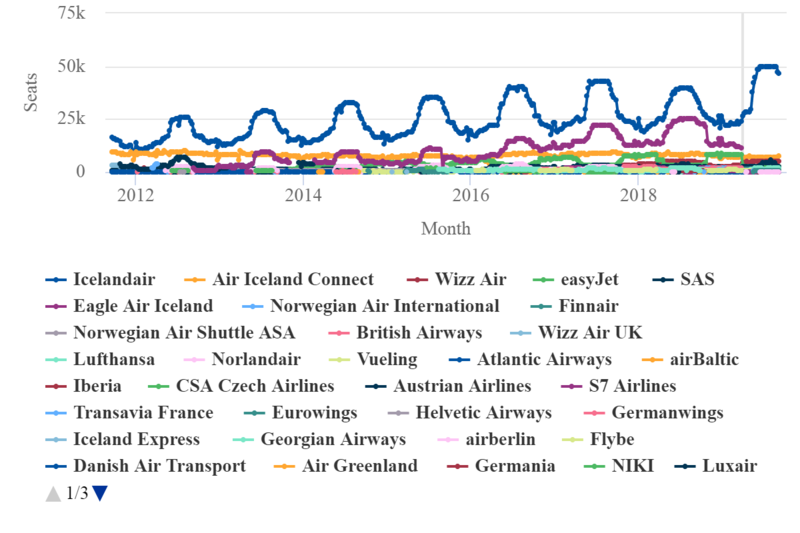 Results for the full year 2018 were not reported before WOW air's collapse, but its situation deteriorated in the latter part of the year. It issued bonds in Sep-2018, raising vital finds, but concerns over its finances increased in 4Q2018. These concerns themselves contributed to the company's financial challenges by adversely affecting its sales and credit status. These problems were compounded by the collapse of Primera Air in Oct-2018, after which WOW air found it even harder to secure finance for its operations. Rising oil prices further added to the pressure. WOW air had been planning to float its shares via an IPO, possibly some time in 2019, but these challenges ruled out that option. Seeking alternative ways to bolster its financial position, WOW air then agreed on a sale to Icelandair Group. This was announced on 5-Nov-2018 but failed to materialise following the due diligence process. WOW air subsequently entered talks with the US private equity investor Indigo Partners about an investment in the airline. When the Indigo talks ended without an agreement in Mar-2019, WOW air recommenced discussions with Icelandair in a last ditch attempt to raise cash to ensure its survival. The failure of these talks finally led to WOW air's cessation of activities on 28-Mar-2019. After the first merger talks with Icelandair ended, WOW air announced that it would significantly scale back its fleet and network. According to the CAPA Fleet Database, WOW air's fleet comprised 11 Airbus narrowbody aircraft at 27-Mar-2018 (including four inactive). This total compared with 18 aircraft one year previously (all in service), consisting of three A330-300 widebodies and 15 narrowbodies. Its fleet was all leased, and so the reduction in size reduced its payments for leases and other operating costs. OAG data indicate that WOW air operated 16 routes in its final week, the first week of summer 2019 (week of 25-Mar-2019), of which 10 were to Europe and six were to North America. This was a reduction by 11 routes compared with the 25 operated in the equivalent week of 2018, which consisted of 14 to Europe, 10 to North America and one to the Middle East. WOW air hoped that this restructuring would win it time to secure new capital and then to rebuild once more. However, this did not work out. OAG schedules data indicate that total seat capacity to/from Iceland grew by 12% year-on-year in 2018, compared with a five-year compound average growth rate (CAGR) of 21% pa.
WOW air's five-year CAGR was 53% pa between 2013 and 2018, versus Icelandair Group's CAGR of 11% pa, while all other airlines collectively grew at 29% pa. In 2018 the Icelandair Group slowed its growth to 4%. WOW air expanded its capacity by 27% and other airlines grew by 10%. WOW air's more rapid growth eroded Icelandair's market share over the years. Icelandair Group had a 47.9% share of all seats to/from Iceland in 2018, reduced from 51.4% in 2017 and 80.4% in 2012 (the year that WOW air launched). Conversely, WOW air's 2018 seat share was 31.4%, up from 27.6% in 2017. Other airlines collectively increased their share to 20.7% in 2018, from 20.9% in 2017 and 15.4% in 2014. Total Iceland-Europe capacity in the peak summer week of 2018 was up by 58% versus 2013, with WOW air's seat numbers up by 175% and Icelandair's up by 37% over the five-year period. Note: WOW air is the mauve line, second graph line down from the top. Weekly capacity from Iceland to North America significantly outpaced capacity to Europe, growing almost threefold between Jul-2013 and Jul-2018. Icelandair more than doubled (an increase of 128%) in this market over five years, and WOW air grew by a factor of almost 11 times compared with the equivalent week of summer 2015 (it only launched routes to North America in Mar-2015). Iceland-North America seat numbers were up by 28% in the week of 30-Jul-2018 compared with one year earlier. Icelandair's growth was 10%, but WOW air's was a massive 51%. Based on analysis of data from OAG for the week of 30-Jul-2018, the two airlines overlapped on 19 routes last summer, out of a total of 60 unique routes operated between them. Nine of the overlapping routes were to Europe and 10 were to North America. The 19 routes represented 42% of Icelandair's 45 routes and 56% of WOW air's 34 routes last summer. 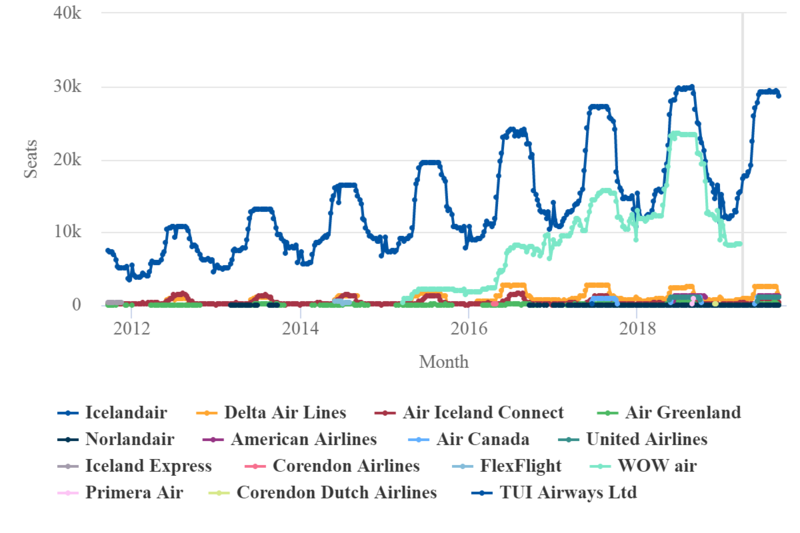 In terms of capacity overlap, the figures were higher: 49% of Icelandair's seats were on routes also operated by WOW air and 70% of WOW air's seats were on routes also operated by Icelandair in summer 2018. The nine overlapping routes to Europe were Copenhagen, Amsterdam, Paris CDG, London Gatwick, Frankfurt, Stockholm Arlanda, Dublin, Brussels and Milan Malpensa. The 10 overlapping routes to North America were Boston, New York Newark, New York JFK, Chicago, San Francisco, Toronto, Baltimore/Washington, Montreal, Dallas/Fort Worth and Cleveland. According to data from OAG, WOW air's capacity dropped by 17% year-on-year in 1Q2019 and was scheduled to fall by 27% in the summer season. Cuts implemented or planned included the suspension of routes to Tel Aviv, Delhi, Edinburgh, Milan, Barcelona, Alicante, Stockholm, Chicago, Cincinnati, St Louis, Pittsburgh, Dallas Fort Worth, Los Angeles, San Francisco and Vancouver and reduced frequencies to a number of other destinations across its network. Icelandair Group increased seat numbers by 2% in 1Q2019 and its growth will accelerate to 13% in summer 2019 (source: OAG). WOW air cut its Europe capacity by 6% in 1Q2019, whereas Icelandair grew by 6%. WOW air's North America capacity was cut by 27% in 1Q2019, while Icelandair's grew by 1%. Icelandair Group also felt the competitive impact of WOW air's rapid growth. In 2018 Icelandair fell into loss, reporting an operating margin of -3.8% after three years of declining profitability. Its operating margin was 11.9% in 2015, when it had been one of Europe's most profitable airlines. Icelandair Group slowed its growth in 2018 in order to restructure and rebuild towards improved profitability. Nevertheless, even with slower growth, load factor on its international flights fell by 1.7ppts, to 81.0%, in 2018. WOW air had 12% of seats to/from Iceland in 2018 and therefore its demise will have a significant impact on the Icelandic market – in particular on Reykjavik Keflavík Airport. Even before WOW air collapsed, Keflavík was expected to suffer a fall in traffic for 2019. Isavia, which owns the airport, "heavily regrets" WOW air's cessation of operations. It said that the airline had been "an important part in the airport's success and a major part of the tourism industry in Iceland". Growth by other airlines will only partly mitigate the loss of WOW air's capacity. Transavia is to launch a three times weekly Amsterdam-Reykjavik service from Jul-2019, directly replacing WOW Air (the route is also operated by Icelandair). Icelandair had already decided to operate to Duesseldorf, a seasonal destination from which WOW air had withdrawn at the end of last summer. It will double its weekly frequency to Berlin Tegel from six last summer to 12 this summer, partly filling the gap left by WOW air's exit from Schoenefeld. Wizz Air is growing capacity to Iceland by 14% in summer 2019 and will launch a twice weekly Krakow service in Sep-2019, thereby becoming the first non-Icelandic airline to operate a double digit number of destinations from Reykjavik. Nevertheless, in spite of expansion by other airlines, these plans will not replace all of WOW air's capacity and the Iceland market will need time to recover its 2018 size. However, in a European context the impact on market structure is minimal. WOW air had just 0.2% of all seats touching Europe in summer 2018 (Icelandair had only 0.3%). As illustrated by the overlap data shown above, WOW air's rapid growth increasingly took it into direct competition with Icelandair (which also suffered). Both offered a connecting strategy, which, in theory, reduces the degree of overlap when the market is viewed as one-stop city pairs, rather than only direct routes. However, much of WOW air's traffic was Iceland O&D and not transferring between Europe and North America. The fact that 70% of its seats overlapped with Icelandair was a competitive challenge. However, it appears that it was the challenges of rapid growth, in particular of funding that growth, that finally did for WOW air. If Iceland and Reykjavik Keflavík will miss WOW air, Icelandair certainly will not. Its main rival's exit leaves it the clear winner in the North Atlantic one-stop connecting market.